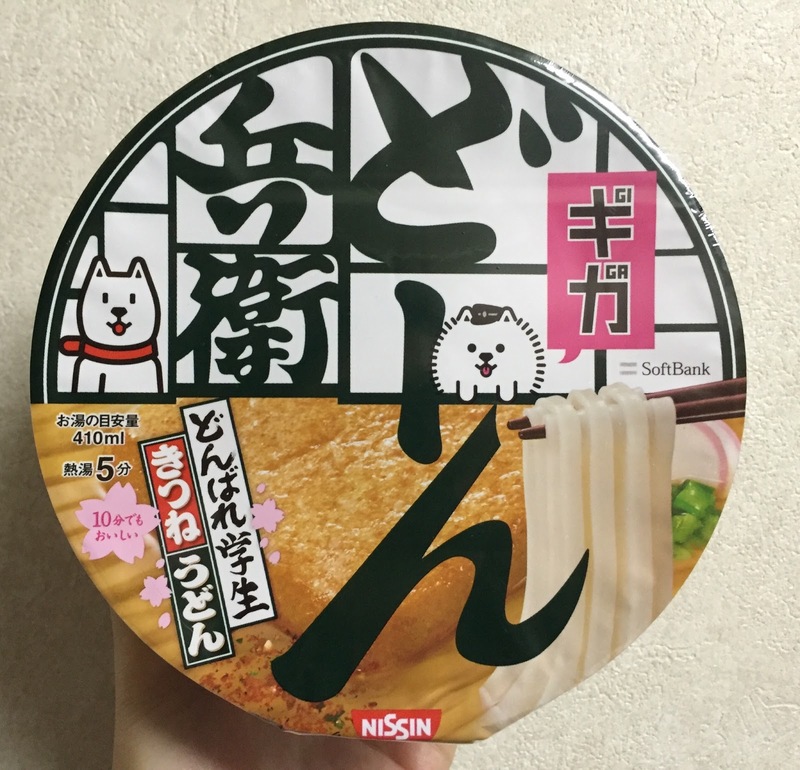 SoftBank is one of the major mobile phone companies in Japan, and they came up with giving away instant noodles several years ago. 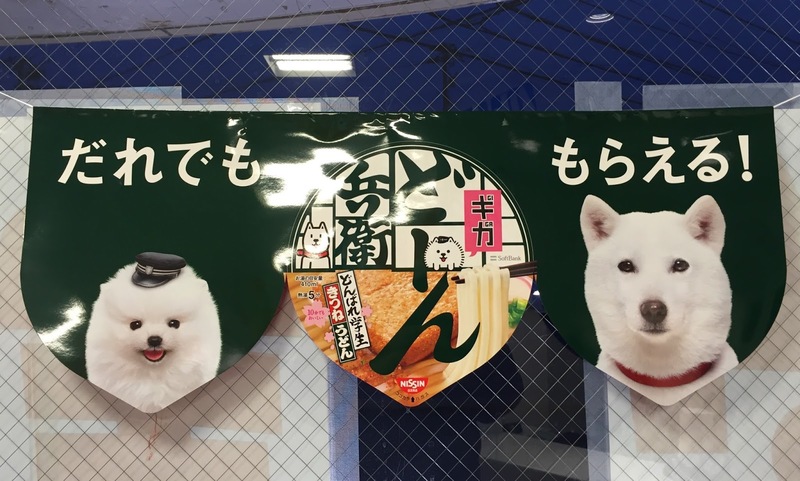 This year, they started providing "Giga Do-n Bei" from February 19, 2016 to any customers who come and visit the shops. This campaign is to promote, I assume, a contract plan which is called "Giga Gaku-Wari (ギガ学割)." * Gaku-Wari (学割) means student discount and an abbreviation of 学生割引. "Giga Gaku-Wari" has been effective since January 15, 2016, and the eligible users are those who younger than 25 years old and their family members. With the plan, you can choose either of the following options; get another 100GB for the flat-rate packet data service or the base cost of the White Plan will be gratis for 3 years. 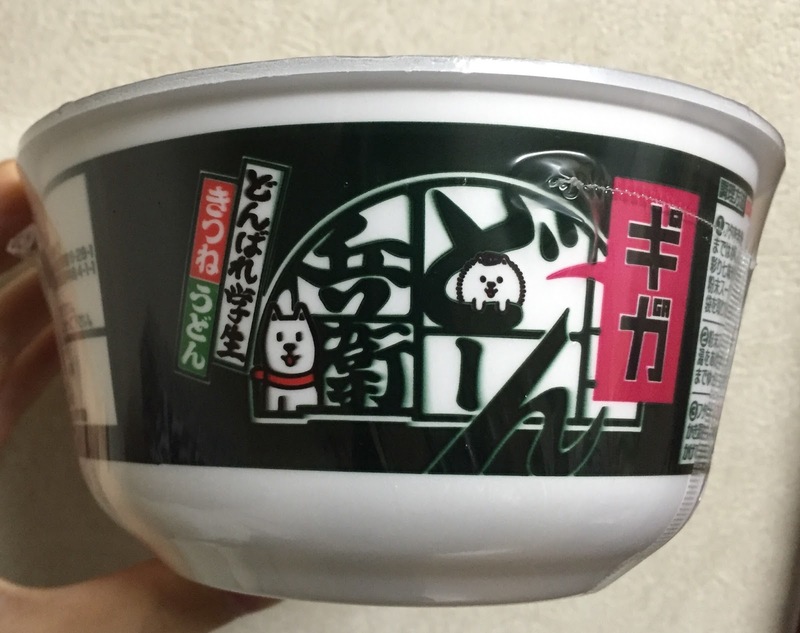 "Giga Do-n Bei" is a collaborated item with Nissin Donbei," which has had 40th anniversary this year. 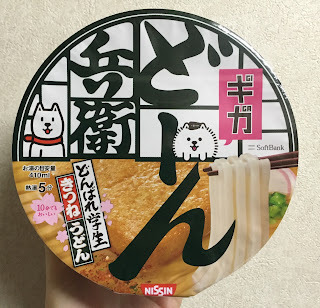 Authentic Nissin Donbei has 日清の (Nissin no, meaning "Nissin's") on the pink rectangle part, but this special product had "ギガ (GIGA)." Also, next to "きつね (Kitsune, fox)" and "うどん (Udon)," it says "どんばれ学生 (Donbare Gakusei)" which is used in their commercials. * Donbare is a weird phrase but they mean to cheer students, and the actual Japanese is "がんばれ (Ganbare, 頑張れ)" and I haven't figured out why they switched the words to this non-sense phrase. Cooking time it 5 minutes, but surprisingly, it says "10 minutes would taste good, too" in pink Sakura. Allergy substances; wheat, dairy, mackerel, soybean, sesame and gelatin. This mini pouch was in the cup and the left side is powdered soup, and the right side was spicy powder to add later. There's a characteristic dried huge aburaage, which is a deep fried tofu. I peeled the lid to the midway and poured boiling hot water, then put the lid back on. Though it recommended to let it sit for 10 minutes, I didn't wanna have flabby and too soft Udon noodles, I just waited for 5 minutes. 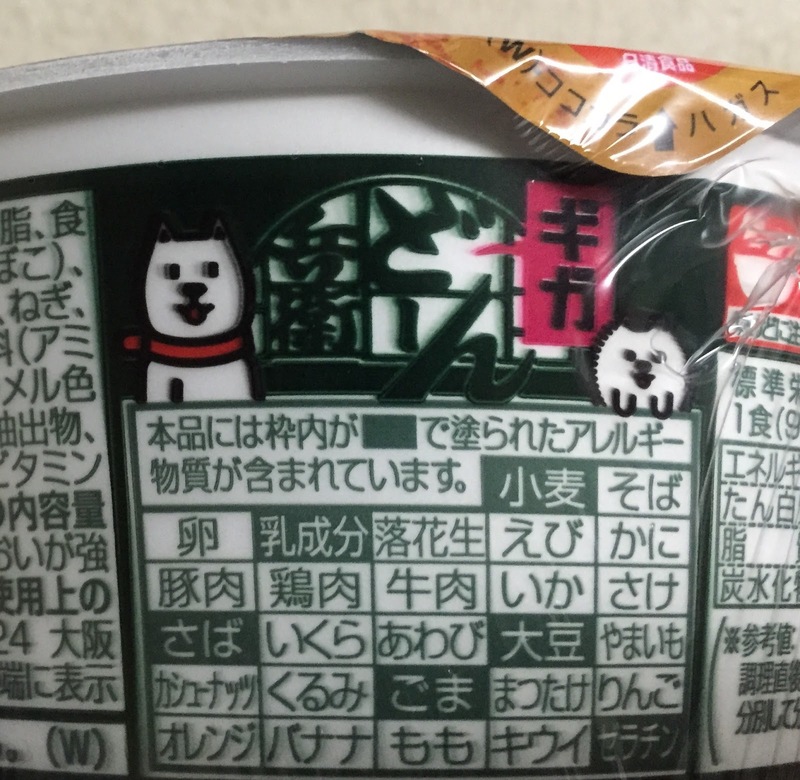 On the inner lid, there're Giga-chan (ギガちゃん) and Oto-san Dog (お父さん犬) who are both SoftBank characters. 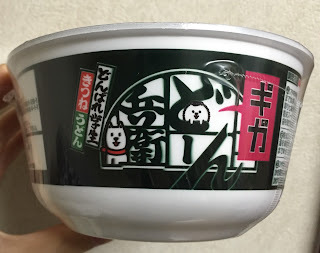 I seriously hate the way GIga-chan talks, of course dubbed by a human, because of the rough languages and phrases, and every time I see the commercials, I get irritated and so did I when I saw this lid. 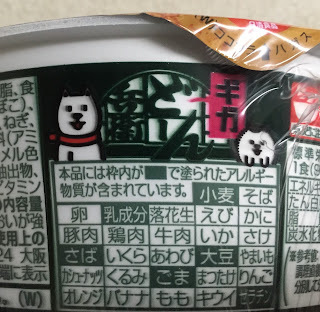 The aburaage absorbed hot water and it had expanded in 5 minutes, and the contents had nice fishy broth aroma. I added the spicy seasoning called Shichimi (七味), and it's a mix of 7 hot peppers and spices. Except the packaging, the soup, noodles and aburaage all tasted like the regular Nissin Donbei. The soup was sweet and salty, udon noodles were soft and still a bit firm in the center like al dente, and my favorite was filled with fish broth soup aburaage, which is already seasoned with soy sauce and mirin, a type of rice wine.